CHAVEZ: will the constitution survive his constitution? Wednesday January 2. 2013: Just made this tableau for what seems to be the last days of Chavez, who is said – by some sources – to have entered a state of coma. 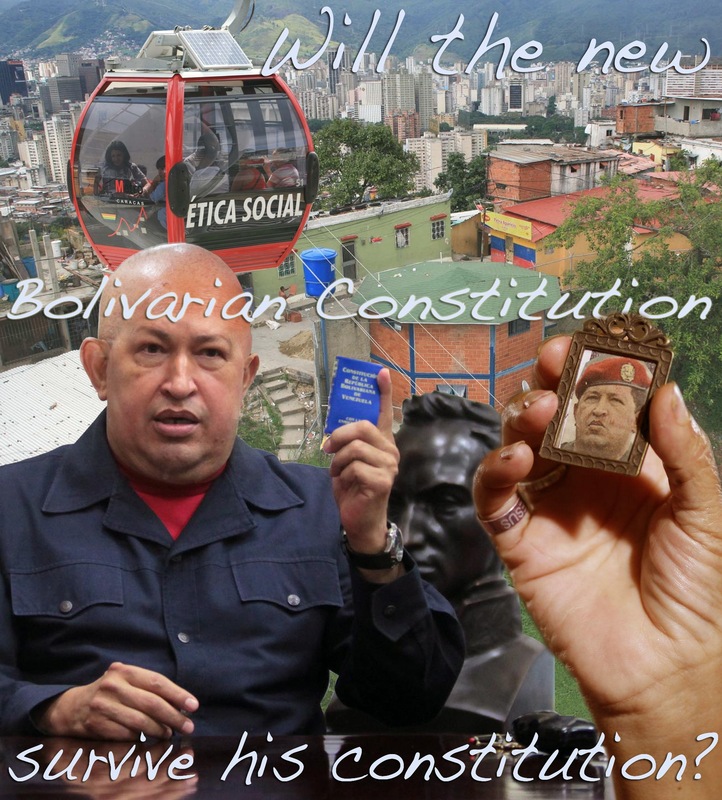 I merged a recent picture of Chavez after his chemo therapy into an earlier picture of Chavez holding the popular edition of his new 1999 Venezuela Constitution. The hand holding an older picture of Chavez as the adored messiahs of the poor… did appear this last week on the internet as an illustration of his followers praying for his well being. His rule was and is authoritarian, but what about those who oppose him now and will try to take power after him? It is lamentable that one of the promising points of renewal in the new Constitution was the declaration of “health care as a human right” (3) while the cancer treatment of the the President of Venezuela is not done in Venezuela, but elsewhere. Chavez has been treated in Cuba that tends to be praised for it’s free and social health care system, but Chavez certainly did not get his treatment in one of the hospitals for the general public. He has been treated in one of the special clinics for the ruling caste of the Castro family and related higher party functionaries. One of the reasons – is said – for this has been the guarantee of information control on the actual state of health of the Venezuelan President as any information on someone with such a contested power impacts directly on national and international politics. If special cancer treatment is of top world level in Cuba is not certain. The economic blockade of the USA imposed on Cuba makes it often difficult to get all the needed medicines, latest equipment and Cuban surgeons have been quoted as they were complaining the limitations they had in participating in international high level medical conferences and other academic fora. As for the praised general level of medical care in Cuba one feels stepping back into Cold War Information times when reading the fiercely pro and contra arguments in news media and on the internet. (4) Also some of the praised facilities, according to several sources, are geared toward ‘medical tourists’ who bring in the needed hard currency for the Cuban government. We will have to wait at least half a decade to pronounce a real judgement on the rule of Chavez. To see if what will come after him is any better or worse…. It is described in Wikipedia in a most positive and glorious way, though there are other who hold another view of it and see it as either “Bolivarian Propaganda” or “Orwellian Newspeak” from the Chavez regime. “The Constitution of the Bolivarian Republic of Venezuela is the current and twenty-sixth constitution of Venezuela. It was drafted in mid-1999 by a constitutional assembly that had been created by popular referendum. Adopted in December 1999, it replaced the 1961 Constitution – the longest serving in Venezuelan history. It was primarily promoted by the current President of Venezuela Hugo Chávez and thereafter received strong backing from diverse sectors, including figures involved in promulgating the 1961 constitution such as Luis Miquilena and Carlos Andrés Pérez. Chávez and his followers (chavistas) refer to the 1999 document as the “Constitución Bolivariana” (the “Bolivarian Constitution”) because they assert that it is ideologically descended from the thinking and political philosophy of Simón Bolívar and Bolivarianism. The Constitution of 1999 was the first constitution approved by popular referendum in Venezuelan history, and summarily inaugurated the so-called “Fifth Republic” of Venezuela due to the socioeconomic changes foretold in its pages, as well as the official change in Venezuela’s name from the República de Venezuela (“Republic of Venezuela”) to the República Bolivariana de Venezuela (“Bolivarian Republic of Venezuela”). Major changes are made to the structure of Venezuela’s government and responsibilities, while a much greater number of human rights are enshrined in the document as guaranteed to all Venezuelans – including free education up to tertiary level, free quality health care, access to a clean environment, right of minorities (especially indigenous peoples) to uphold their own traditional cultures, religions, and languages, among others. “Article 83: Health is a fundamental social right and the responsibility of the State, which shall guarantee it as part of the right to life. The State shall promote and develop policies oriented toward improving the quality of life, common welfare and access to services. All persons have the right to protection of health, as well as the duty to participate actively in the furtherance and protection of the same, and to comply with such health and hygiene measures as may be established by law, and in accordance with international conventions and treaties signed and ratified by the Republic. Article 84: In order to guarantee the right to health, the State creates, exercises guidance over and administers a national public health system that crosses sector boundaries, and is decentralized and participatory in nature, integrated with the social security system and governed by the principles of gratuity, universality, completeness, fairness, social integration and solidarity. The public health system gives priority to promoting health and preventing disease, guaranteeing prompt treatment and quality rehabilitation. Public health assets and services are the property of the State and shall not be privatized. The organized community has the right and duty to participate in the making- of decisions concerning policy planning, implementation and control at public health institutions. – High ranking in number of references (and less when it comes to the quality of arguments) is the movie by Michael Moore (Sicko is a 2007 documentary film by American filmmaker Michael Moore. The film investigates health care in the United States, focusing on its health insurance and the pharmaceutical industry. The movie compares the for-profit, non-universal U.S. system with the non-profit universal health care systems of Canada, the United Kingdom, France and Cuba.). The method of bringing not well treated patients from the USA to Cuba, in itself can not produce anything else than distortions, once such an idea is actually realised as a movie. The official web-site of the movie Sicko describes the part of the movie that concerns us here as follow: “After detailing just how the system got into such a mess (the short answer: profits and Nixon), we are whisked around the world, visiting countries including Canada, Great Britain and France, where all citizens receive free medical benefits. Finally, Moore gathers a group of 9/11 heroes – rescue workers now suffering from debilitating illnesses who have been denied medical attention in the US. He takes them to a most unexpected place, and in addition to finally receiving care, they also engage in some unexpected diplomacy.” The most unexpected place a a Cuban clinic. One of the greatest fallacies about the so called ‘Cuban Revolution’ has to do with healthcare. Foreigners who visit Cuba, are fed the official line from Castro’s propaganda machine: “All Cubans are now able to receive excellent healthcare, which is also free.” But the truth is very different. Castro has built excellent health facilities for the use of foreigners, who pay with hard currency for those services. Argentinean soccer star Maradona, for example, has traveled several times to Cuba to receive treatment to combat his drug addiction. But Cubans are not even allowed to visit those facilities. Cubans who require medical attention must go to other hospitals, that lack the most minimum requirements needed to take care of their patients.